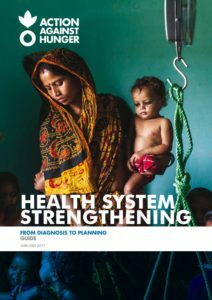 The Health System Strengthening from diagnosis to planning Guide provides an overview of the approach and describes eleven steps covering the preparation and planning processes. In 2010, Action Against Hunger, an international nongovernmental organization, identified the need to develop an easy to use guide to help identify health systems gaps and bottlenecks at District level in order to allow the development of health system strengthening strategies. External specialist conducted two studies in order to develop ACF understanding on HSS and propose recommendations in terms of approach. From 2011 onwards Action Against Hunger started to review other partner’s experience in HSS and existing literature, tools and methods. A first version of the actual guide was developed in 2013 and second version early 2015. The two versions of the guide were piloted from 2013 to 2016 with government (Ministry of Health) counterparts in 12 countries. Action Against Hunger was previously viewed as a nutrition organization but has drastically reconsidered its approach in the last 10 years and shifted from a vertical approach focused on nutrition interventions (particularly the management of severe acute malnutrition) to a horizontal and health system strengthening approach. This section explains what the rationale of this shift is.